Download a summary of the tasks, options, and approaches associated with understanding causes of outcomes and impacts. 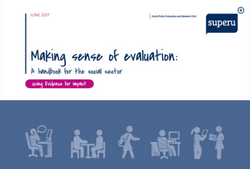 Most evaluations need to investigate what is causing the outcomes and impacts of an intervention. (Some process evaluations assume that certain activities are contributing to intended outcomes without investigating these). Sometimes it is useful to think about this in terms of ‘causal attribution’ – did the intervention cause the outcomes and impacts that have been observed? In many cases, however, the outcomes and impacts have been caused by a combination of programs, or by a program in combination with other factors. In such cases it can be more useful to think about “causal contribution” – did the intervention contribute to the outcomes and impacts that have been observed? Recorded webinar: Jane Davidson's overview of options for causal inference in a 20 minute webinar in the American Evaluation Association's Coffee Break series. Free to all, including non-members.